Whether you grow them for their many medicinal purposes, for use in the kitchen, or simply for their beauty and fragrance – herb gardening can be a lot of fun! Knowing when to plant and how to care for your herbs is half of being a successful gardener. Often more important is knowing the proper techniques for harvesting your precious herbs. Read on for some priceless tips and tricks that will help you get the most out of your garden. For most herbs, you never want to harvest more than one third of the entire aerial growth at one time. This ensures that the plant will have plenty of leaves to regrow itself afterward. However, there are some exceptions to the rule. Chives, for example, grow back faster if all of the leaves are cut off within an inch to a half inch from the ground. Many species in the mint family (including catnip and lemon balm) regrow more efficiently if all of the stems are harvested at once – cut above the first or second set of leaves from the base of the crown. Basil – Once the plant reaches 6 – 8” in height. Chives – As soon as the leaves are thick enough to use. Cilantro – Once stems are 6 – 12” long. Lavender – Harvest at any time once stems have flowered. Lemon Balm – Leaves may be harvested at any time during the growing season. Oregano – Sprigs may be harvested once the plant reaches 3 – 4” tall. Best in mid-summer. Parsley – Any time after mature leaves appear. Peppermint – Harvest at any time during the growing season. Best just before blooms appear. Rosemary – May be harvested at any time. Sage – Harvest only lightly during the first year of growth. Second growing season and thereafter, harvest any time year-round. Tarragon – Any time after new growth begins in spring. Thyme – Harvest at any time. Best just before blooms appear. Different types of plants have different preferred methods of harvesting. Leafy annuals like basil should be gathered by pinching off bunches of leaves from the tips of the stems. Be sure to clip stems close to a leaf-pair so as not to leave a stub. This will help the plant to regrow and encourage bushier plants with more tender leaves for the next harvest. Herbs with long stems like cilantro, parsley, lavender, and rosemary should be cut near the base of the plant – about an inch from the ground. Leafy perennial herbs such as oregano, thyme, sage, and tarragon can be harvested by the stem or sprig. 4. Flower, Seed, or Leaf? Some herbs may be harvested for multiple purposes. Knowing when and how to harvest these plants for your specific purpose may require a bit of finesse. Cilantro, for example, has a short life-span that progresses rapidly from seedling to flower and seed. If your goal is to harvest cilantro for its leaves, you’ll have to keep an eye on these plants. Once they bolt, leaves become scarce and the herb will have to be replanted. However, if your desire is the coriander, you’ll want to wait until the flowers form seed pods then trim the entire stems and place them upside in a paper bag to dry. Herbs such as lavender and echinacea which are grown primarily for their flowers should be harvested just before the blooms are fully opened for a more potent and longer lasting aroma. Other herbs like basil and fern-leaf dill are commonly encouraged to produce more leaves by removing flower stalks once they appear. Herbs such as oregano, thyme, and mint are most flavorful just before they begin to bloom, making this the best time to harvest their leaves. Many herbs can also be allowed to go to seed in order to propagate themselves. Cilantro / coriander is very easily replanted this way throughout the growing season due to its large seed pods. Parsley is another herb that is easily harvested for its seeds as they grow in bunches on the ends of the plant’s flower stalks. Some herbs like basil and oregano have tiny seeds which are best harvested by clipping off matured flower stalks and allowing them to dry in a cool, dark, protected environment. On the topic of propagation, there are many herbs which may be harvested and regrown from clippings. Some good examples are basil, rosemary, and mint. Lovely leafy basil clippings are made by cutting off a few long stems, removing all but two to three leaf-pairs as well as any flower stalks, then placing the stems in water to root. 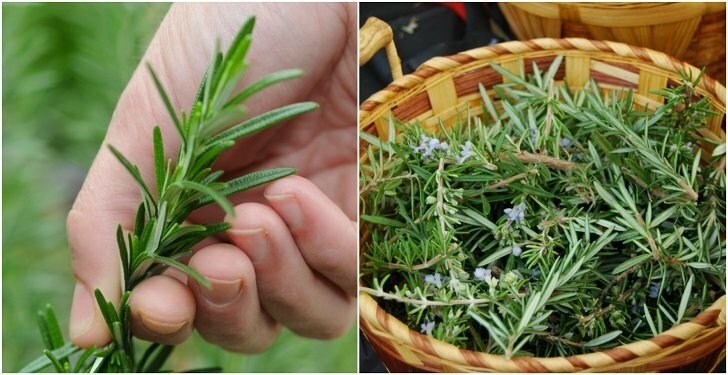 Rosemary and mint clippings may be taken from fresh new growth, trimmed of extra leaves (to form a long-stemmed sprig), then planted directly into damp soil. Some perennial herbs can be harvested year-round like cold-hardy thyme and rosemary. Others should be allowed a rest period before the first frost so the plants aren’t stressed before they go into dormancy. For leafy perennials like sage and mint, you’ll want to do your last big harvest about two months before the first expected frost then harvest only lightly from that point on unless your herbs are in pots and you plan to bring them inside for the winter. This is probably the most popular and widely-used method for preservation of harvested herbs. Drying works well for woody-stemmed herbs like rosemary, oregano, and lavender. Simply cut off long stems, bundle, and hang them up to dry. When harvesting herbs for drying, make certain that they are free of dew to avoid mold growth. Alternately, you can use a food dehydrator to quickly preserve your fresh herbs without the risk of contamination. These handy machines have a long list of other great uses as well. Add cut herbs to olive oil or make herb-flavored butters to preserve them. This technique cuts down on wilting and discoloration, and often seals in flavors better than other methods. Just remember that your herbs must not have drops of water on them when they are added to oil, otherwise you run the risk of bacterial contamination. To be extra safe, you may want to dry your herbs using one of the methods listed above before adding them to oil or butter. Also, check out this great article for more tips on using oils and butter to preserve your fresh herbs. Herbs can also be preserved with vinegar. Save bottles and corks to reuse for this technique. Simply add your fresh herbs like rosemary, tarragon, or basil to clean glass bottles and fill with a vinegar of your choice. Remember that your herbs will have to compete with the flavor of the vinegar they are stored in. Try mild white vinegar for more delicate herbs. For powerful herbs like rosemary or basil, use full-bodied vinegar like apple cider vinegar. Paint the leaves with oil and store them flat in a resealable freezer bag. Chop up your herbs in a food processor or blender with a little bit of oil to form a paste. Wrap in wax paper and freeze. Then, when you’re ready to use your preserved herbs, simply cut off however much you need and replace the rest back in the freezer. A clever way to freeze herbs without oil is to chop them up and drop the pieces to ice cube trays filled with water. When you’re ready to use them, simply pop out a cube or two and thaw your herbs as needed. Use salt to preserve herbs like rosemary, tarragon, marjoram, and oregano. Alternate layers of salt and whole leaves in a jar (or other resealable container) pressing firmly between layers until the jar is full. Alternately, add about 6 tablespoons of herbs to one cup of coarse ground salt in a blender and mix until well incorporated. Store salted herbs in air-tight containers until ready to use. For sweet herbs like mint, use sugar instead of salt for a flavorful treat!